Be warned that Granada is not an easy city to negotiate by car. Most advice that you might find will tell you to park up early and walk it, bus it or take a taxi from there. This is good advice. Granada city is littered with underground carparks but, as you would imagine, parking can be expensive in the very centre of town. 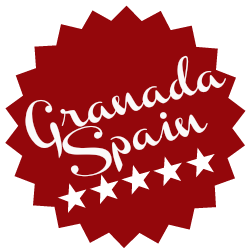 Not only that, but you could also find yourself in a bit of a tangle getting in and out as Granada, with its narrow streets, bus lanes and one way systems, is not a city for the uninitiated driver. 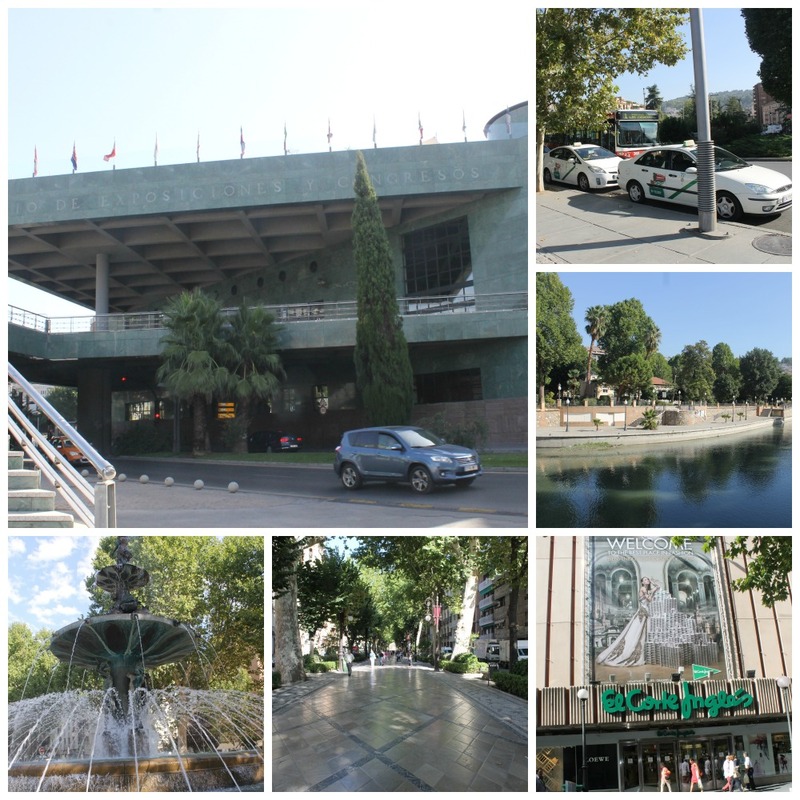 This car park is a personal favourite and the first choice car park for GranadaSpain as it is well signed and relatively simple to get to from the motorway and it is also a pleasant walk from there to Puerta Real. See directions below. If you are approaching from the South (La Alpujarra and Costa Tropical) take Junction 132 for Ronda Sur/Sierra Nevada/Alhambra off the A-44/E-902 and stick to the left hand fork following signs for Granada and Palacio de Congresos. At the first roundabout take the second exit onto Ctra. Bailén-Motril/N-323a, get into the right hand lane and take the first exit at the next roundabout onto Avda. Fernandos de los Rios. You will see Carrefour on your right. Go straight over (3rd exit) at the next roundabout (or take the underpass) onto Paseo del Violón and you will see the Convention Center Palacio de Congresos looming large in front of you. If you are approaching from the North/West (Granada Airport, Sevilla, Jaén) take Junction 129 towards Centro Ciudad/Recogidas off the A-44/E-902 and then the 3rd exit the off the roundabout onto Calle Eudoxia Piriz. The road will take you over the river to the next round about where you turn left (3rd exit) onto Avda Fernandos de los Rios. Go straight over (3rd exit) at the next roundabout (or take the underpass) onto Paseo del Violón and you will see the Convention Center Palacio de Congresos looming large in front of you. 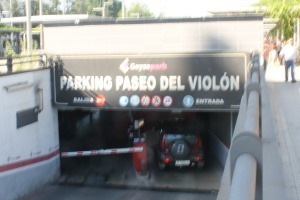 Paseo del Violón passes under the building. Drive under and then go all the way around the round about to the entrance of the car park (just after the taxi rank and tourbus stop). On foot from here you walk alongside the Rio Genil on the Paseo de los Bastillos until you reach the Puente Blanco. Cross over and hang right to approach the Paseo del Salon and the Fontana Salon. From here you cross over to the Carrera de la Virgen, a shiny marbled avenue (El Corte Inglés on your left) that takes you to Puerta Real, the centre of town. This is a 5 to 10 minutes stroll and very pleasant on a sunny day. Buses and taxis are available outside the car park. Click here for a Parking Map for Granada. This car park gets you just a little bit further into town, but beware. If you miss the entrance to the car park you will be headed straight into the centre of town. To get there take the directions to the Palacio de Congresos (see above) but continue on Paseo del Violón (straight on at the Palacio de Congresos roundabout) to the next junction at Puente Blanco. The car park entrance is right there on the left as you turn left to go over the bridge on to Acera del Darro (heading to Puerta Real). If you do happen to miss the entrance, don’t panic, cross the bridge and look out immediately for the Puerta Real car park on the right hand side after the department store El Corte Inglés. This car park, however, is more expensive and also is more likely to be full. If you really want to avoid driving in the city altogether and don’t mind jumping onto a bus or into a taxi this is perhaps the easiest car park to locate and negotiate. Take Junction 129 towards Centro Ciudad/Recogidas off the A-44/E-902 (this stretch of the motorway is the Granada Circunvalación, or ring road, passing the City on the western side) and exit the roundabout onto Calle Neptuno. There are car parks on either side for the Neptuno shopping Mall. From Neptuno you can go into the centre in a virtual straight line along Calle Neptuno and then Recogidas to Puerta Real and on to Plaza Nueva via Reyes Catolicos. This will take you at least 20 minutes on foot and is a rather uninspiring and energy sapping walk across a number of busy junctions through the commercial district. Don’t feel that you will be missing out on anything if you decide to take transport from Neptuno into the centre. If you are headed for your hotel with luggage you should take a taxi or, if you are traveling light, you could take Bus Route no. 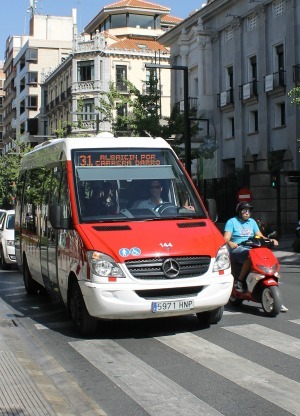 6 and jump off at Gran Vía for easy access to most central city locations. Head for this one if you want to approach the centre from the west. It is also a quick walk from the car park to Arco de Elvira from where you can catch buses 31, 32 and 34 to the Albayzín. Take Junction 128 off the A-44/E-902 and then the 2nd exit off the roundabout onto Calle Méndez Nuñez. Go straight over Plaza Albert Einstein (road bears slightly left) onto Avda. Fuente Nueva. When the road forks stay left heading down Calle Dr. Severo Ochoa, get into the right hand lane and turn right at the junction onto Avda. de la Constitutión. If you are staying at any of the Alhambra Hotels or just visiting the Alhambra for the day the easiest (though not the cheapest) parking can be found on site. Click here for more information on how to get the the Alhambra.